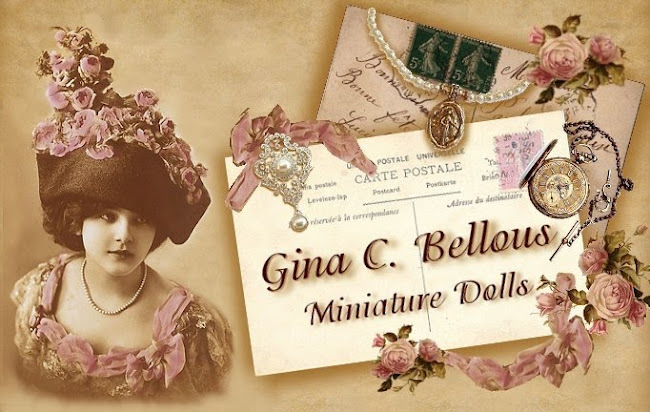 Gina C. Bellous Miniature Dolls: ♥ Portrait Sisters ♥ - Almost Dressed! Here are Stephanie & Jocelyn Almost dressed. They still need their fancy red trimmed collars and cuffs as well as knee socks and leather Mary Jane's. 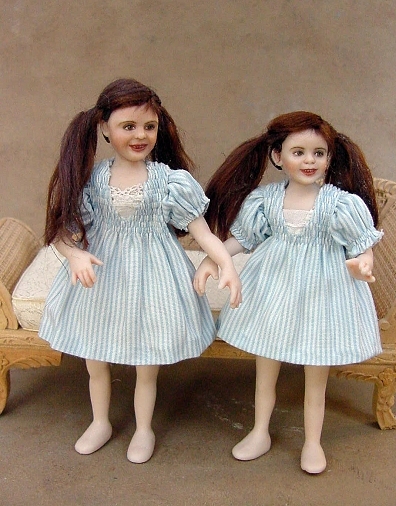 The poor girls will also need their hair combed out and restyled. I had to make some alterations to the original pattern. When working is such a small scale, sometimes illusion wins out over reality and different techniques must be used to keep things n scale. 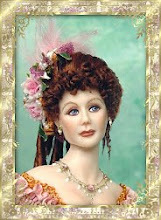 The original dresses are very simple and translate to a rather plain finished dress in miniature. I decided to add some small gathers to give the skirt a nice shape without bulk rather than add the original "tucks" that were eased into the skirt to fit the bodice. The dress hangs nicely with a nice soft look to the folds rather than looking stiff like it did with the original drafted pattern.